The 11th annual Kennebunkport Festival kicks off this week. It’s a great time to visit Kennebunkport for food lovers. As part of the Festival, the Historic Inns of Kennebunkport wanted to do something special for our guests that focused on good food, the beautiful inns and takes advantage of the lovely weather we have here in June. The Historic Inns of Kennebunkport Garden Parties were born. Held on the Saturday afternoon of the Festival, chefs from the Inns create a “Taste of Maine” themed event. Maine wine, cheeses, beers and whoopie pies are all on offer. When tasked with coming up with something that epitomizes Maine, we at the 1802 House thought….”what’s more Maine than a lobster roll”? As we aren’t from Maine, our lobster roll is not quite traditional. However, it has been a big hit with guests and Mainer’s alike so we’re sticking with it! We’ll be serving these again next Saturday, 14 June. Up until now, the recipe has been a closely held secret. 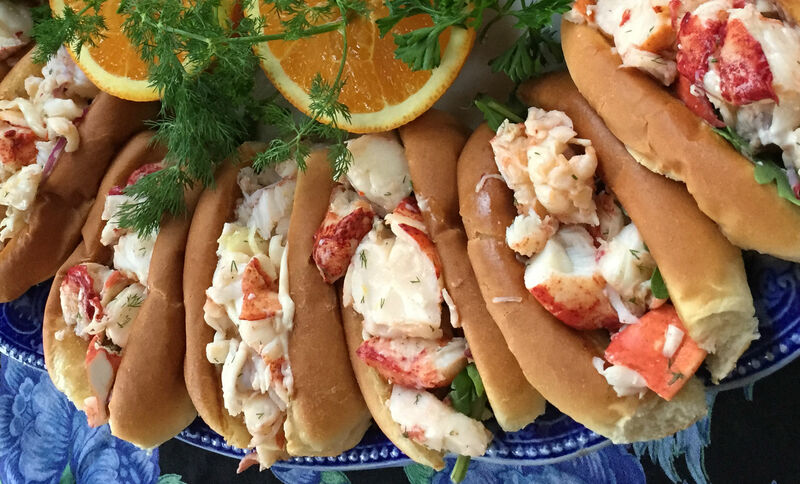 We were very pleased to host a number of travel writers when they visited Kennebunkport recently and served them our mini lobster rolls as part of the Historic Inns progressive dinner. They loved them so of course the secret is out. Our new friend Suzanne Stavert (www.adventuresofemptynesters.com) stayed here at the 1802 House and asked if she could share our recipe in her post and of course we were happy to oblige. If you can’t make it to the Kennebunkport Festival, and keeping with our “Best lobster roll in Kennebunkport” discussion, here’s the recipe. I don’t know if they’re the best in Kennebunkport, but they’re certainly at the top of that list! Cut your rolls open, butter lightly on the inside and toast to a golden brown on a griddle. In a large bowl, combine bite sized lobster meat chunks with 1 teaspoon finely grated lemon zest, the juice of one lemon and the chopped dill. Toss well to mix thoroughly. In a small bowl, combine the mayo and sriracha sauce. The amount of sriracha can be adjusted to suit your tastes. We keep it mild with only a little heat so you get the flavor of the chili but not too hot. To assemble, take your toasted roll, spread mayo over it, add a couple slices of onion and a few pieces of arugula. Heap the lobster meat on top. This entry was posted in Food, Historic Kennebunkport by admin. Bookmark the permalink.